A simple but great team exercise! 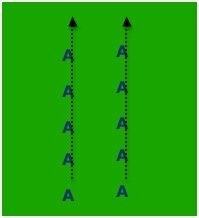 - Your 2 line warmup are just 2 even lines, jogging across the field and back, or around it. - All players warming up together, should maintain same pace. - 7-10 minutes for this team 2 line warm-up.